PARAMARIBO – Although the chance of finding survivors is getting smaller by the hour, rescue workers have found one of the victims of the deadly attack on four fishing boats on Friday. The man was said to be in critical condition was rushed to the hospital by ambulance after being brought ashore this afternoon. He allegedly said to his rescuers is that the attackers said “we came to kill” when they were attacked Friday night. Wednesday Lieutenant Colonel Jerry Slijngard, director of the National Coordination Center for Disaster Management (NCCR), said that while the situation is grim it is not impossible to find survivors. He argued that some of the missing fishermen could have managed to reach shore and hiding in the mangrove or trying to reach populated areas by navigating to the bush. So far three bodies were recovered by the authorities. Police here say that the survivor had been spotted at Braamspunt, a small fishing village in Commewijne. The man told his rescuers that he walked through the swamp for five days looking for help. He arrived at Braamspunt this morning at 10 o’clock. Fishermen in the area took care of the injured man, according to police. The Maritime Police were then called in, after which the police transferred him to Leonsberg from where he was taken to the Academic Hospital. 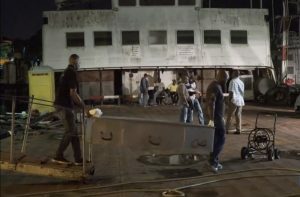 While authorities here are still searching for victims and recovering bodies from last Friday’s deadly attack on four fishing boats in Surinamese waters pirates attacked another fishing boat Wednesday night killing at least one fisherman. According to Mark Lall, secretary of Visserscollectief, a local fishermen’s association, the captain of the boat was killed. The whereabouts of his crew members is uncertain. Several fishing boats, the Coast Guard and other law enforcement agencies went to the area near Matapica Canal where the latest attack allegedly took place. “When we arrived at the location we will know more about what has happened”, Lall told local media. Meanwhile, in the Guyana government’s first public statement, President David Granger on Thursday said Guyanese were deeply aggrieved by the massacre which has left 11 missing and feared dead owing to piracy. Three bodies were recovered Wednesday and one was found in a critical condition, reducing the number of unaccounted persons from 16 to 11. “We are deeply grieved by the tragedy, clearly some Guyanese have been victims,” he told members of the media on Thursday. Meanwhile, Surinamese authorities reported that there was a second piracy attack on Wednesday off the coast of that former Dutch colony, resulting in the death of a fisherman. Meanwhile there is strong evidence that the latest attacks are no ordinary or random acts of criminals robbing fishermen of their catch or other valuables. Several sources indicate that a turf war between Guyanese fishermen is going on over ‘rights’ in Suriname’s fishing grounds. At least Friday’s attack seems to be a retaliation for the killing of a pirate leader several weeks ago. According to Slijngard there is credible intelligence that a gang of 9 to 11 criminals led by two Guyanese brothers are responsible for recent attacks on fishermen. One of the brothers is based in Guyana while the other has residence in Suriname, said Slijngard. In the meantime the Surinamese authorities passed the names of several suspects to the Guyanese police in a bid to apprehend them.